Finding myself with a free day on a trip to LA last month, I decided to explore Downtown, something I had always wanted to do. While I quickly learned that it is best done with a little advance planning (It proved impossible to get tickets to the Broad Museum or the temporary Museum of Ice Cream without advance purchase), at the very least I could visit a bookstore I had read about and finally see the Walt Disney Concert Hall. Although admittedly difficult to leave the Four Seasons poolside, I Ubered down. Vibrant, gritty, relatably East Coast Urban with a California flair, it was a great experience. My first stop was the Last Bookstore. It is a bibliophile's dream, more than worth the trip on its own. With no set itinerary afterward other than seeing the Concert Hall, I was able to indulge in one of my favorite activities, meandering about observing local architecture. The graphics of its art deco sign drew me down a street towards the Barclay hotel. 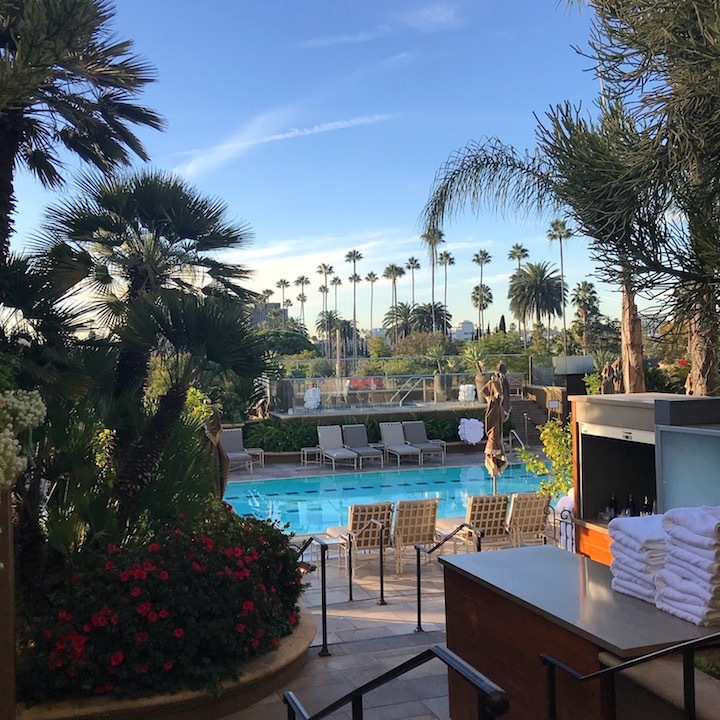 It was deceptive however, for the building (Originally the Van Nuys Hotel) dates from the late 1800s and is constructed in a restrained Beaux Arts style. Still operating, albeit on a decidedly less glamorous scale than when originally built, its lobby still retains many of its architectural features. The Bradbury Building located at 304 South Broadway, is on nearly everyone’s list of must-see architectural landmarks downtown. Built in 1893, the public is allowed inside its famed skylit atrium. The staircases, elevators may look familiar, as it is a popular location used in multiple movie, television and video shoots. Directly across the street from the Bradbury Building at 307 South Broadway is one of Los Angeles earliest movie palaces, built by the legendary Sid Grauman. 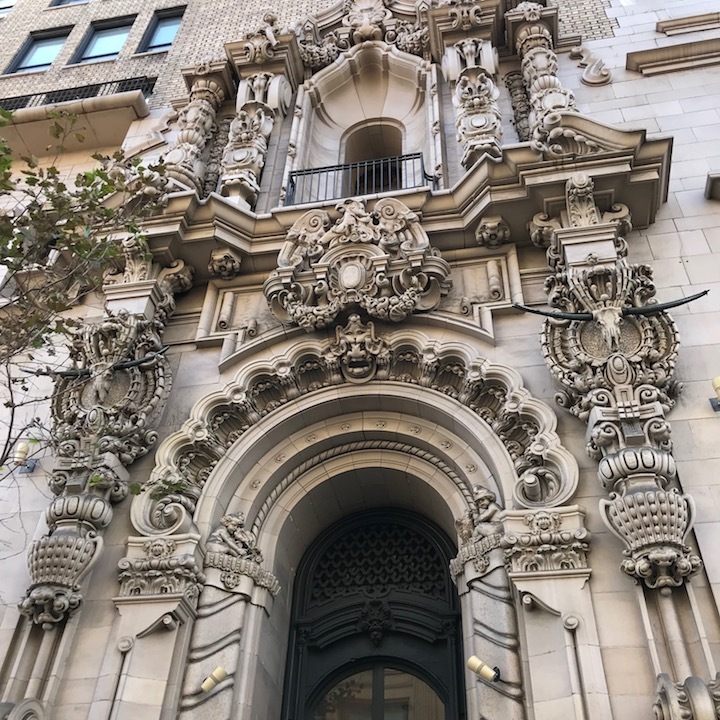 Dubbed the million dollar theater when it opened in 1918, the stupendous Spanish Baroque revival inspired exterior decorations were executed by Sculptor Joseph Mora. They include such disparate elements as Egyptian gods, Classical statues, griffens, longhorn skulls Buffalo heads other odd features. Just down the street, the Los Angeles Theater was one of the last movie places built, but no less lavish. Designed by S. Charles Lee. It was constructed in 1931 in a French Baroque style. Though I couldn’t see in, its majestic lobby is said to feature mirrors, columns, chandeliers, finely detailed plasterwork, and a crystal fountain. as well as the Broadway Arcade building. Nearby, The building housing the Los Angeles Jewelry Center appearedto have been plucked right out of Emerald City in OZ. 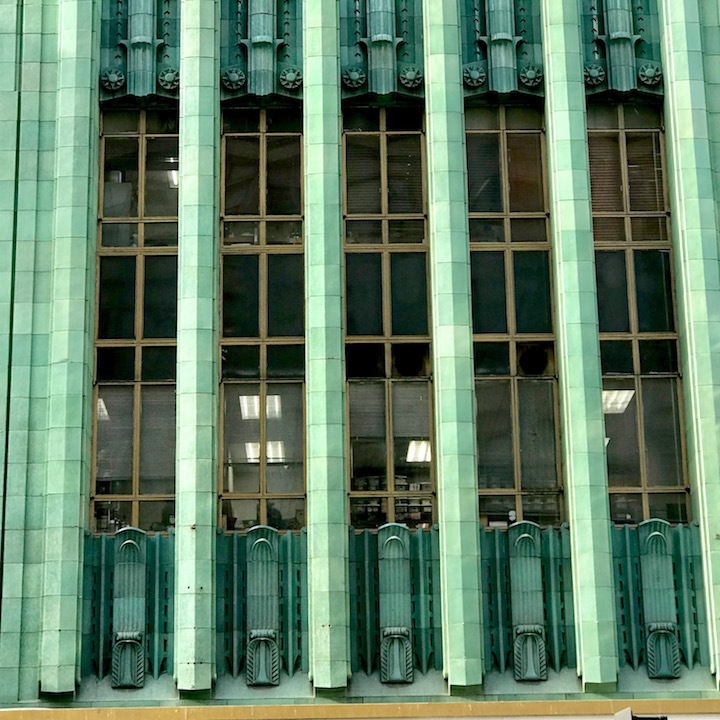 Designed by Architect Claud Beelman, the fluted brilliant blue-green glazed terracotta piers (which I initially mistook for oxidized copper) rise fourteen stories to the roofline, electrifying the buildings façade. While not quite as showy, this nearby buildings simple yet luxurious art deco façade also caught my eye. Designed by architects Percy A. Eisen and Albert R. Walker in 1931, It originally housed an outpost of the household goods business F&W Grand Silver Stores. In 2015 plans were announced to restore the structure to its former glory. After seeing a bit of the City’s architectural past, I decided it was time to head up the hill and experience some of the “new”. Just missing the departure of the funicular railway at Angles Steps, I opted to walk up the adjacent steps, emerging onto a modern plaza that felt as it different from the area below it as one could imagine. It was easy to spot the unique silhouette of the Disney Concert Hall from the Plaza. It sits next to the Broad, one of the City’s newer museums. It is an interesting building. A void puncturing its perforated façade reminded of a hole left in a screen window caused by an errant rock thrown from a lawnmower. While this section of downtown had nowhere near the same foot traffic and vitality as the older sections below, it allowed me to fully experience the architecture of the Disney concert hall all to myself. I walked around the entire structure, getting to see the undulating metal clad waves against the clear blue skies from all sides. It was past three pm by then, and not knowing if rush hour was imminen I Ubered back to Beverly Hills post haste. While my brief few hours in Downtown barely scratched the surface, it fueled my appetite for another, formally planned visit on my next trip.